Today I want to talk about something that I used to find myself facing quite often - creative overwhelm. There are so many talented people sharing their creations, new products coming out, and platforms to take in creative content, that we can sometimes become overwhelmed. For a long period I went through an "I want to try that! ", "That could be my new style! ", "I NEED that new product!!" phase where I was consuming so much creatively, I became overwhelmed and my own content began lacking quality. If you can relate to any of that, know that it is not something to be ashamed of, and something we all face at times. But also know, that speaking from experience, not feeling the need to buy the latest product, finding your own style, and producing more content than you consume is SO much more satisfying! 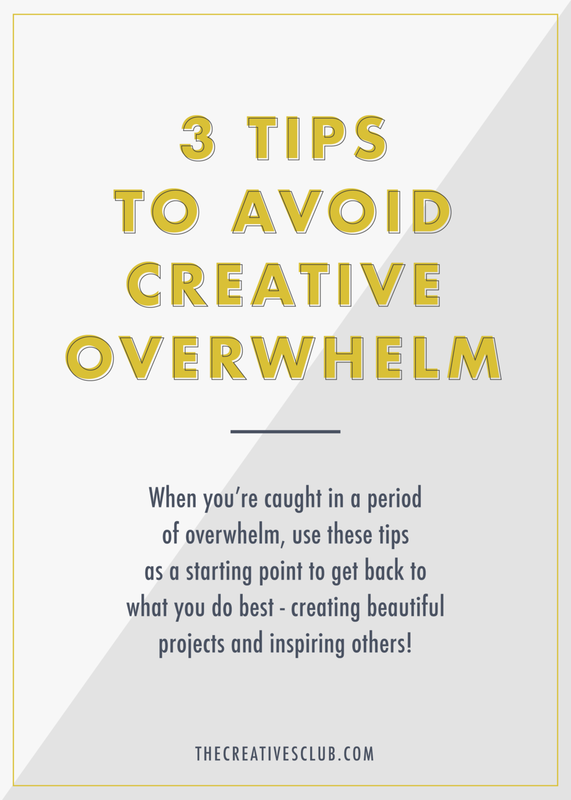 I wanted to share three of my top tips for avoiding this creative overwhelm, so you can get back to what you do best - create gorgeous pieces and inspire others! This is something that has helped me numerous times. As much as I am inspired by the creatives around me, there is also something so inspiring about my own life and daily experiences. When I am feeling creatively overwhelmed, I take a short break from creative consumption. For me, this means a little less time on social media and YouTube, but it may mean something completely different for you! During this time, I like to focus on my own creative talents and the skills I've started to develop/want to dive deeper into. I use this short break to step back from what everyone else is doing and try to work with my current skillset and stash. It's always shocking to me how stuffy my brain feels before doing this, and how relaxed/free it feels after - almost like hitting a little reset button! I know I'm not the only one that has random crafty products everywhere that I haven't used up. When I'm feeling overwhelmed with new product releases, I challenge myself to use my stash. If I'm paper crafting, this may mean creating "kits" from my stash to do memory keeping with. If I'm doing a mixed media project, this may mean going through my supplies and pulling out paints I can mix to make a new color. One thing I love to do, no matter the craft I'm working on is to try to use my supplies in new ways. During one particular time of overwhelm I undertook the challenge of using 5 products/supplies I currently owned, and putting them to a new use than what I originally purchased them for. While I don't remember what I did with all five, I do remember one in particular - ink markers. I started using my Faber-Castell Big Brush Pens as watercolors. It felt edgy and crazy at the time and got me out of a creative funk. Now it's a technique I use on a regular basis! I am a planner through and through. I strongly believe that there are few things that can't be solved by putting them down on paper. When I'm feeling overwhelmed, either from lack of ideas, overload of ideas, etc. I plan it all out. I've found a lot of times, I'm not even overwhelmed creatively, I just have so many creative topics on my mind and not enough space to store them. It takes brain power to get creative, and if your mind is too busy thinking about other things, or storing things you want to remember for later, you'll feel stuck when it comes to getting crafty. Now tell me - what do you do when you're feeling creatively overwhelmed? Have any other tips/tricks we should try? Let's chat in the comments below!